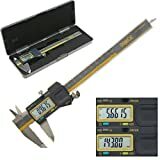 Digital calipers have been in existence as measuring tools for several decades, and although most people consider them as ancient measuring tools, they have not lost their usefulness in contemporary culture. In fact, they are more useful in most fields. These devices are being used quite often across a broad spectrum of woodworking, medicine, construction, and engineering. 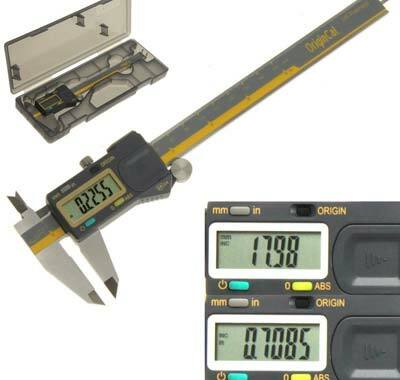 Over the years, these simple tools have remained to be the most accurate measuring tools. 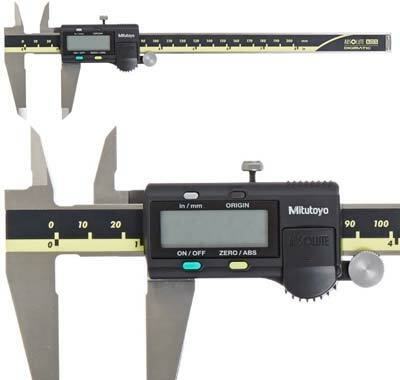 Though all calipers have been designed to perform the same task, Digital calipers have the advantage of taking the guesswork out of adjusting and reading manual measurements. They have proved that complexity and function do not always produce the best result. If you are here looking for quality and accuracy, then you are on the right page. We have done the hard part of separating the grains from the chaff. 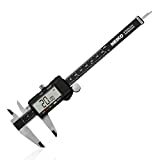 The following are top ten electronic digital calipers that will get you the accuracy you need. 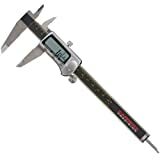 Constructed from stainless steel, this caliper allows you to get metric or SAE decimal readings even in harsh conditions. 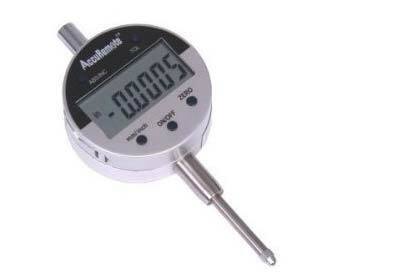 It has an easy-to-read digital display that allows you to measure and convert from SAE to metric quickly and easily. This device can be used for inside, outside, depth and step measurements. When it comes to accuracy, it measures within +/- 0.001 in or 0.03mm. It also features an automatic shut-off and storage case for easy transport. Just by having a look at this electronic gadget, you will realize that Westcoast tools took extra steps in the polishing and finishing process which makes it look more sleek and professional. 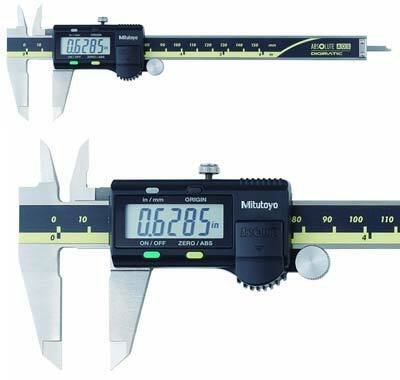 This digital caliper stands out in quality and accuracy when compared to its rivals that fall in the same category. Its stainless steel body is highly respected and is a regular choice for most people. It has a super large display (2-3/8* 7/8) which allows the reader to get the measurements easily without straining. The gadget is also water, oil, and dust resistant. Additionally, it has 0-6 accuracy. An accurate measurement is useless if you can’t read it accurately. 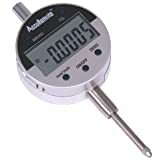 That is why this device takes an essential tool into the 21st century with extra-large LCD digital readout for exact internal and outside measurements. One feature that stands out is its accuracy ability of up to .001-inch. It can instantly convert Metric or SAE without any difficulties. The device has a machine grooved thumb-roll mechanism and position lock for sure adjustment. Additional features include; precision ground jaws, stainless steel shaft, and depth measurement probe. 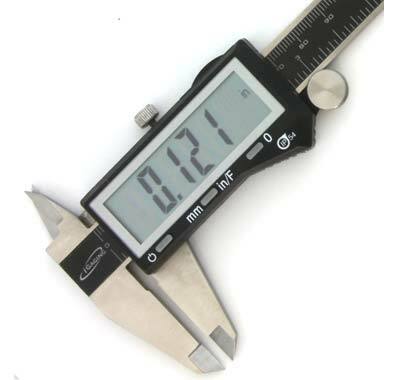 This caliper has a high accuracy absolute of .001”. The tool keeps track of its original position once set. Its easy-view large LCD displays the actual sensor position ready to start measuring hence eradicating the need to reset zero. The measuring speed is unlimited. Additionally, it has a standard USB data output with a high-quality surface finish for extra smooth slider movement. At a temperature of 0-40 degrees and relative humidity of 80%, the tool works perfectly. The battery can last for more than two years of normal operation. 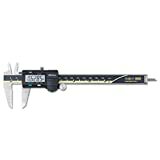 This digital caliper has 0-8” (0 to 200mm) measuring range with 0.0005” increments for precision and advanced onsite sensor. Equipped with the exclusive new AOS sensor technology, the tool offers improved measurement dependability by increasing resistance to harsh workshop conditions. It also has an electromagnetic inductive sensor that provides improved resistance to environmental conditions such as oil, dirt, and water that might cause false readings. The tool is also compatible with existing Mitutoyo digimatic peripherals like SPC cables, U-wave wireless transmitter. Its SR44 battery is long lasting, and the gadget can go up to 3.5 years without any problems when used well. This six-inch model can just be the right size for your toolbox. It measures in metric or English. 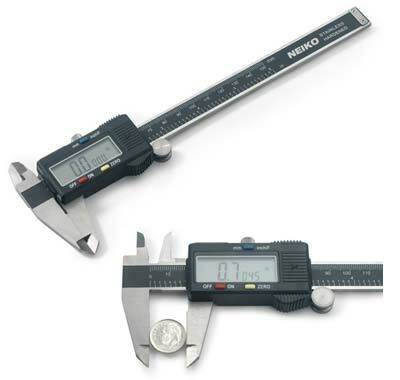 The tool has a zero feature that can be useful when you will require relating measurements. The display turns on automatically when you use the caliper and has an auto off and on the feature. 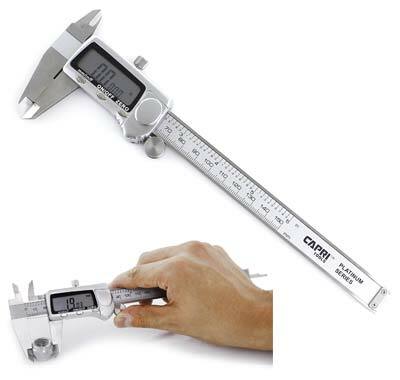 The caliper is made of sturdy metal and operates smoothly and has accurate readings. In addition, the tool has a lock screw to keep the caliper at a set opening. Talk about this product and all you will get is positive reviews. This tool has great qualities that have beaten other similar products in the market. The excellence is because of the greatest accuracy developed by the company. This tool is easy to operate and has a button to switch between inches to mm. 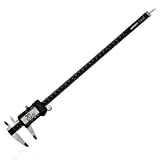 Its durability is accounted for by its hardened stainless steel shaft with depth measurement probe. It has a firm grip thanks to its precision ground jaws. 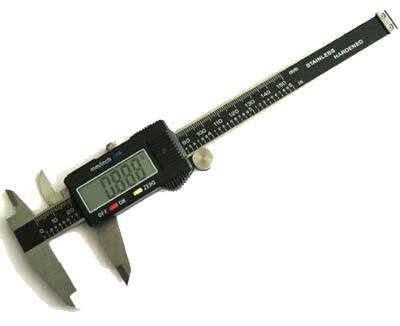 This caliper is made of high-grade stainless steel and feels very heavy and sturdy when holding it. The slider is made of steel, not plastic. The graphics measuring gauge on the face of the rule can be set into a recess that runs the length of the rule. It has a very nice graphics display for macro measurements. It has zero buttons that let you zero the measurement at any position. The tool is great for measuring tolerances in the positive and negative. 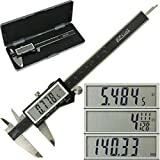 This Ultimate Digital indicator measures the interior and exterior width, depth and step in fractions and decimals on a large LCD. It features external large easy read digital LCD screen and comes with its own Heavy Duty Fitted Case. It’s a tool worth investing in. This gadget has 0 to 8” (0 to 200mm) with a measuring range of 0.0005”.Its electromagnetic inductive sensor helps in resisting dirt, oil, and water that might alter the actual readings. Its digital readout LCD shows an inch or metric units for versatility and allows either absolute or incremental measurement readings. It can measure inside, outside and step values for versatility and includes a protective case. 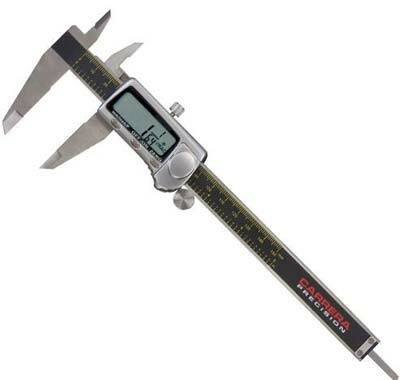 In case you are looking for a decent and efficient caliper, then this is the one to go for. It has a large display and high precision for mechanical applications. Lug back or flat back and 3/8” stem allow installation of this indicator on any magnetic base. Inch and metric are its two reading functions apart from possessing ABS. The caliper also has an accuracy of +/- .001. The indicator also comes with extra batteries just in the case to replace the current ones. 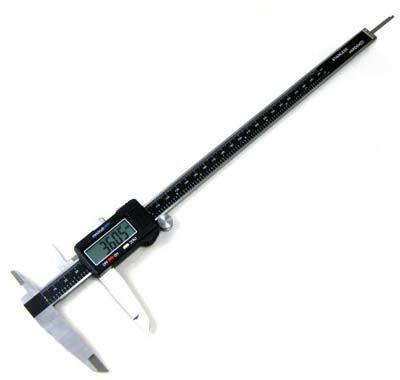 It’s a caliper that has positive reviews and rates well in most online stores. You might consider this device, it’s highly recommended.